**Updated 2012 version What To Wear To The Pumpkin Patch Going to the pumpkin patch in October is one of our favorite fall activities. I loved visiting the pumpkin farm as a kid and enjoy taking my son (and snapping lots and lots of pictures). Here are some tips and inexpensive, stylish options on what to wear that are hayride-proof and will hopefully encourage us moms to get in front of the camera. 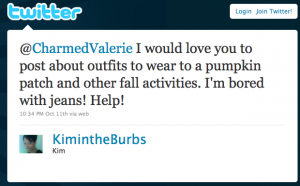 Kim wants to know what to wear to a pumpkin patch and other fall activities. Dress comfortably and appropriately! You’ll likely be there for a few hours, in lines, wrangling children, climbing into the hayride tractor, in the heat (if you’re in the South) etc. Consider this when planning your outfit. I love skirts as much as the next girl, but the pumpkin patch probably isn’t the best place for them (as a mom). Easy on the orange. You don’t wear white to a wedding, let’s give the pumpkins their due respect. I say this more for contrast in photos because nobody will notice that you’re holding a pumpkin if you’re also wearing an orange shirt. Easy on the perfume. Bees like pumpkin patches too so don’t try to out fragrance the flowers (and wipe down the kiddos after they eat/drink). All pieces are under $30, the purple top is maternity, the green top/gray jeans are plus-size. I choose henley-style tops because they are lightweight (for those of us in warmer climates) or you could look for a thermal henley if it’s cold. The boots will insure that your toes and ankles are safe from whatever is lurking in that pumpkin farm grass. The hip-slung crossbody bags are perfect for your camera, smartphone, diapers, and any other essentials. The scarf...because scarves are awesome. And a rockin’ cuff bracelet because every outfit needs a “wow” piece. Did you like this post? Are you heading to the pumpkin patch this October? What do you plan to wear? Any tips or tricks I forgot to mention? 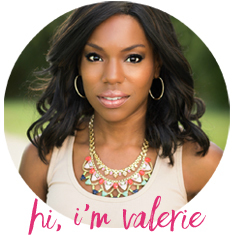 I’d love for you to leave a comment! I think you are brilliant! Love the tips especially about NOT wearing an orange shirt….LOL! I have all the basic pieces in my closet, but love the accessories you chose. Off to shop….the boots and cuff bracelet. You ROCK! Thanks! Love it…where’d you get that yellow scarf? You’re welcome Kim! Now I’m that much more excited to go to the pumpkin patch.